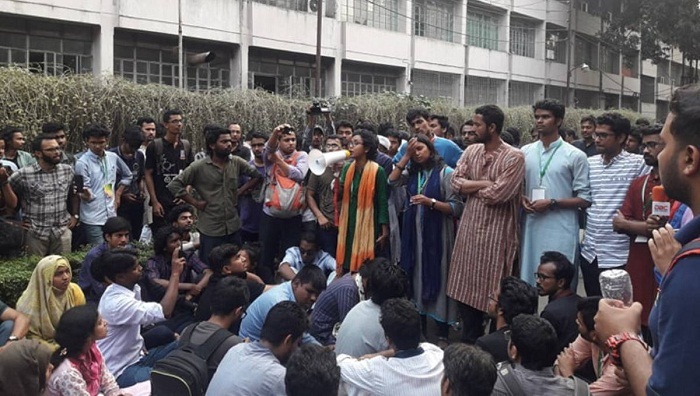 Jatiya Oikya Front, led by Dr Kamal Hossain, on Monday alleged that the incident of Dec-30 vote “robbery” reappeared in the DUCSU polls as the country’s election system has collapsed. “There had been huge enthusiasm among students and political leaders over the DUCSU election as it was held after 28 years. But, unfortunately, the nation today witnessed the incident of Dec-30 election in the polls,” said Oikya Front’s spokesperson Mirza Fakhrul Islam Alamgir. He came up with the remarks while speaking at a press briefing after a meeting of Oikya Front Steering Committee at Dr Kamal Hossain’s Motijheel chamber. Fakhrul said the Dhaka University students strongly protested the vote “robbery and terrorism by the ruling party students with the help of the university authorities”. “We condemn and protest the election irregularities in the DUCSU polls and we extend our all-out support to the student’s justified demand,” he said. Fakhrul, also the Secretary General of BNP, said the DUCSU polls and recent upazila election have demonstrated once again that the country’s entire election system has collapsed. The voting in the long overdue election to Dhaka University Central Students' Union (DUCSU) and its hall unions was held on Monday.